The Apostle Thaddaeus was from Edessa, a Jew by race. When he came to Jerusalem, he became a disciple of Christ, and after His Ascension he returned to Edessa. There he catechized and baptized Abgar (see Aug. 16). Having preached in Mesopotamia, he ended his life in martyrdom. Though some call him one of the Twelve, whom Matthew calls "Lebbaeus, whose surname was Thaddaeus" (Matt. 10:3), Eusebius says that he is one of the Seventy: "After [Christ's] Resurrection from the dead, and His ascent into Heaven, Thomas, one of the twelve Apostles, inspired by God, sent Thaddaeus, one of the seventy disciples of Christ, to Edessa as a preacher and evangelist of Christ's teaching" (Eccl. Hist. 1: 13). The Apostle's joyous feast is come with radiant splendour; let us keep it on this day with jubilation and gladness. For to them who ever honour him in sincere faith, it doth grant their sins' forgiveness and true divine health; for he hath great boldness as a divine initiate of Christ's omnipotent grace. 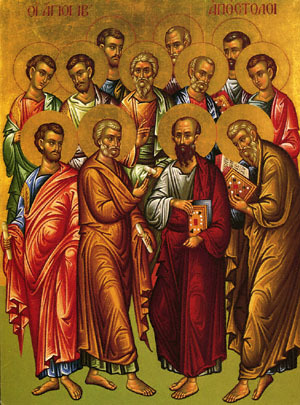 Share the feast of The Holy Apostle Thaddaeus with an icon greeting ecard.